From the "why bother" files of forgeries of common, inexpensive Roman coins, I present this example I just photographed with the inventory to be added to the store today. Don't know if this was a one-off or if it's part of a new effort by some low-life looking to rip off our hobby. I suppose we could mention the possibility that the low life was looking to rip off the economy of his own day rather than ours. I'm completely unclear on how to tell after cleaning but this coin is from the period from which we have clay moulds of supposedly ancient forgers. Could this be a circulation grade fake from the day rather than a tourist grade fake from today? A decade ago when I bought my coin below, both the seller and I thought the coin was an ancient fake and the workmanship seems consistant with the clay mould techniques. Today we see anything as fishy as this we assume modern criminals rather than ancient. Perhaps this is a comment on the decline of the hobby as much as on the coins themselves. Do you accept as ancient any of the clay moulds from this period? Do you have images of coins the fakes they produced that show how to separate the old and bad from the new and worse? I never bought one of the molds not being clear on how to tell the old from the new. Now we are increasingly faced with telling real fakes from fake fakes. You bring up a good point and I admit I thought about the possibility of my example being an ancient fake. In hand, there is something about it that says modern to me, but I can't put my finger on it yet. I have not handled any of the clay molds and have not seen, to my knowledge, any examples determined by the hobby as having come from ancient molds. How would modern and ancient cast fakes look side by side? Not certain. I sent a PM to Voz, hoping he might have some insight, being a specialist in Tetrarchic coinage. Thanks for the interesting example from your collection. Again, I can't say for certain, but from our two photos, I do think your coin looks more "ancient" than mine. I know - the surfaces both have cast spots and mushy devices, but your example just "seems" ancient and mine doesn't. Could be the conservation. Could be the overall look of the surfaces. Not 100% sure. It has been forty years since I looked at the tetrarchic coin molds question, but I remeber some have been recovered in a controlled archaeological dig, one at least with a cast coin still in it. Now if I can remember where I read that. The name of Milne comes to mind as the author. Thanks Mac - I'll have to see if I can find out more info about the Milne ref. I thought I would add another coin similar to your examples for review. This follis of Diocletian (9.6 grams - 24mm) was sold (cheaply) as genuine, though I was fully aware it was a cast counterfeit based on the soft details and surface casting pockets. For me, the attraction was the hole and plug. The coin has a nice patina and there is much impacted dirt around. These factos couple with the hole and plug, plus the lack of the typical ‘sandy’ surfaces more commonly seen on modern counterfeits, leads me to believe this is ancient. I welcome opinions. It was possibly holed to be worn as jewelry, and at some point plugged and probably returned to circulation. The aspect that it was counterfeit, holed and plugged probably had little impact in the ancient world. 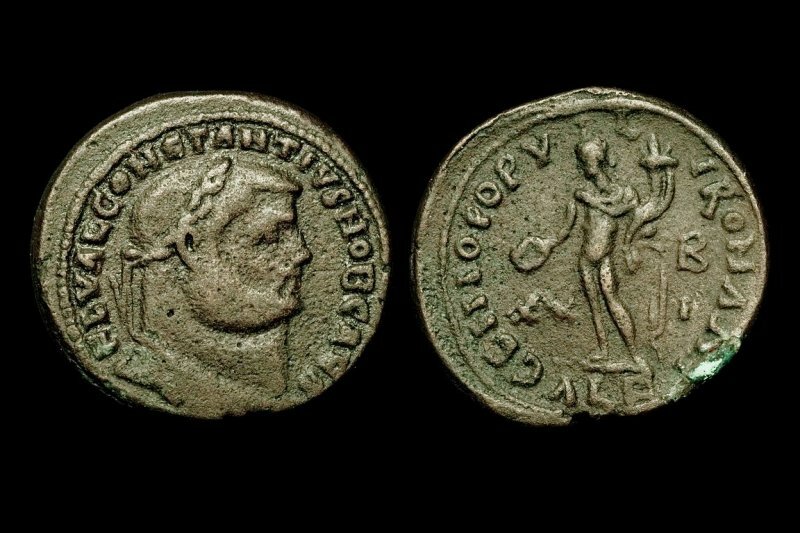 I agree the Diocletian is ancient and am less than 100% certain it is cast just from the photo. The coin has had a hard life and that causes problems that look like casting even on good coins. You have a great advantage seeing it in hand rather than photo and certainly may be correct. The plugged hole could be from uses other than jewelry and the plug seems heavy for the hole if intended to circulate so I'm not willing to say anything about the 'why' it was done.